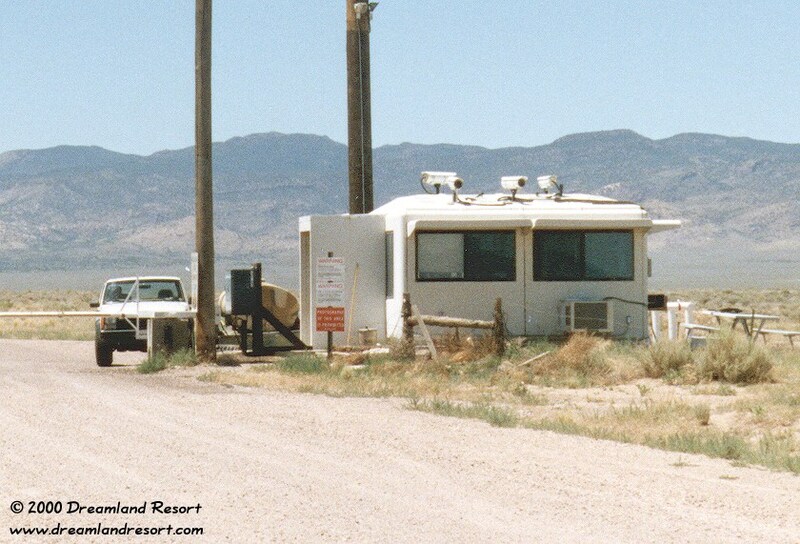 The photos below show the old Area 51 North Gate (or Back Gate) before it was upgraded in October 2000. An old fence and a single barrier marked the border. The Guard Shack was just inside the fence, and in order to check in arriving vehicles, the security guard had to step out on public land. The tall pole held antennas for the old security radio system, which has since been replaced by the 400 MHz trunking system with several repeater sites on nearby mountain tops. 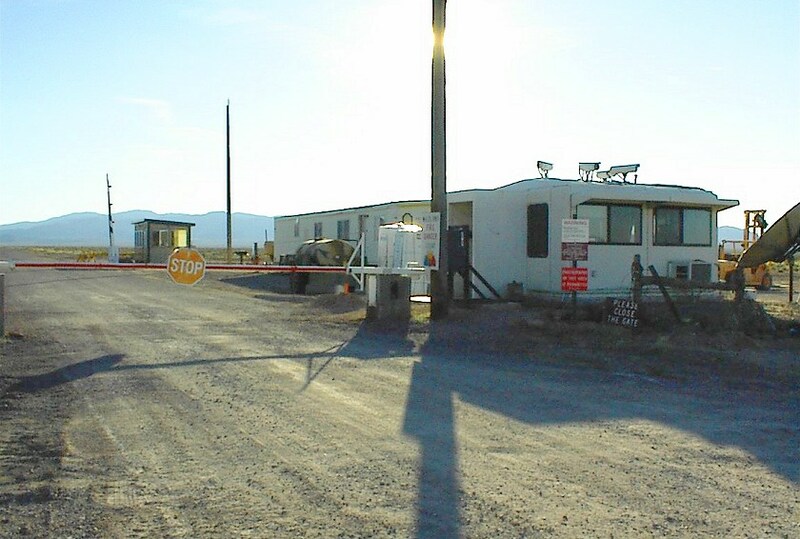 The Area 51 North Gate, and the Guard Shack. 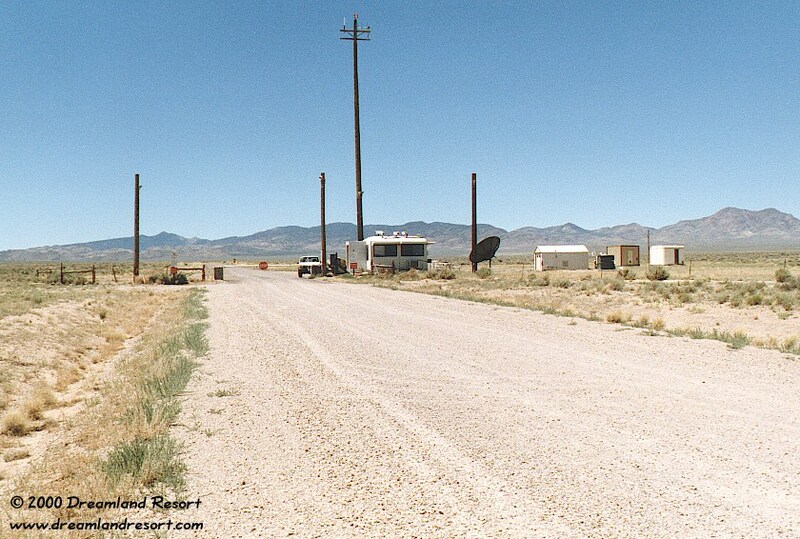 Unlike its equivalent on Groom Lake Road, this one is very visible, and you can drive right up to the barrier. The road continues roughly west inside the boundary, and then turns south, along the western slope of the Groom Range towards Area 51. The large dish is for Satellite TV and the buildings on the right are storage and generator sheds. Close-up of the Guard Shack. The guard on duty usually disappears inside as soon as a civilian vehicle approaches on the dirt road. Notice the white Jeep Cherokee parked in front, and the impressive array of cameras on top of the building. The warning signs are the same as on Groom Lake Road. Photos taken on 7/21/1999. This was the first photo ever published of the new Guard Shack. It was taken on 9/30/2000, during construction of the new shack. It still shows the old gate, and the cameras sitting on top of the old Guard Shack. The chain-link fence has not been installed yet. The new inner black and white barrier is open in this photo, and apparently not yet in use. The trailer between the two Guard Shacks is for the construction crew, and has since been removed. Photo by Everett Worthington, with friendly permission.